This section will try to explain what a "community aquarium" is, the type of fish we can keep in it and the basics of setting one up. You can also expand on the basic worldwide community to the more region specific communities by visiting the Biotope page. One of the strongest points to having a community aquarium is that interesting species from all over the world can be mixed to form a tank that can be the showcase or the only aquarium you will ever desire to have. I would also like to include what everyone is keeping in their community aquarium(s), As I believe it will further help anyone interested in starting in this great hobby and act as a guidepost of what to keep. Please fill out this simple form and send it to me I will post all the replies in a table format. Heres the FORM. You can also Email me your list. Click here to see what other readers are keeping. An interacting population of various kinds of individuals (as species) in a common location. We as aquarist will expand on this to say a community aquarium is a collection of various fish and plant specimens, that can thrive and get along well with each other, but do not necessarily share the same origins or geographic regions (biotopes). Now that the definitions are out of the way lets get down to some specifics. Before you start making your community aquarium, you should have a clear idea of what you want your tank to look like and have a good understanding of the tank basic set up and maintenance needs. The first goal of a community aquarium has to be to provide a healthy, stable and stress free environment for a wide variety of fish species. The second goal of the set up is to arrange the aquarium in such a way that it is a beautiful and pleasurable display that you can be proud of. Any size aquarium can be used to set up a community tank, but remember the larger the tank the more choice in fish species and the larger amount of fish you can keep. A large aquarium also has the benefit of a more stable biology and fluctuations in water chemistry are slower to appear. For demonstration purposes we will be using the standard twenty gallon high tank (12 X 24 x 16) as the basis of our examples. Like all tanks, the community one will need filtration, heating, lighting and a cover as basic equipment. I will touch lightly on each here as much more detailed information can be found in the "Basics" and "Genesis" sections of the site. I recommend the use of and outside power filter in the tank. They are easy to use and clean as well as doing An excellent job of filtration. You want one that will circulate the tank water at least four times in an hour, more is OK as I have found that you cannot have too much circulation in a tank. I our example tank you will need a filter that has an output of at least eighty gallons per hour. Read the box well as the numbers on the filters do not always tell what the actual flow rate is. I really like the Hagen aqua clears, but there are plenty of other great filters out there. I do not recommend the use of undergravel filters in any tank, especially one where you hope to have live plants in. As we are dealing with tropical fish, you will need to maintain a stable water temperature. On average you will need two to four watts per gallon to maintain a temperature in the mid seventies. For our set up a 100 watt heater will be ideal. I use and can only recommend "Ebo-Jager" heaters. Florescent lighting is the only way to go. The tubes now come in all wave lengths and colors and are economical and cool to run. If you are planning on keeping live plants you will need two to four watts of light to keep them happy. In our example that means you will need more than one fixture. Double light strips are available and are a must at a minimum. If you are using plastic plants one light will be enough. A cover is also needed, it keeps our fish in the tank and it also slows down the evaporation of the water. There are two types available. The full hood is a plastic cover that matches the tank and can be very attractive. The other is he glass canopy, which is made up of hinged glass and fits in the frame of the tank. I recommend the glass canopy due to its versatility, you can add light fixtures as well as move them from front to back to achieve different lighting effects. It is also very easy to keep clean and retains its clarity. The plastic hoods are attractive, but they do not give you the option of adding additional lighting as well the area where the light shines to the tank is made up of clear plastic, which I have founds turns opaque over time. Setting up the fish tank is just like any other, it is a natural progression of stages here they are outlined. Choose your location wisely, You want no direct sunlight as this will cause an excess of algae. Make sure the floor is level and will support the weight. water weighs 8.3 pounds per gallon, so you can see the larger tanks can have some substantial weight. Put the tank on the stand and check for level. An uneven tank can cause the glass to crack from stress. Wash your gravel well to remove all sediment. 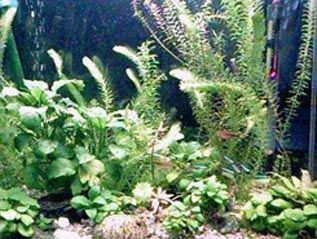 For our tank we will need about twenty pounds (one pound per gallon), If you are planning to use live plants now is the time to add a gravel enhancer, like laterite, which will feed the plants for a long time. Add your rockwork and driftwood. Make sure the rocks are not calciferous as these will slowly dissolve and raise your pH. Slowly fill the tank with water from a hose or bucket. try not to disturb the decorations. Once stabile add your live plants with the tall growing ones to the back and sides. Let the whole system run for a few days to clear up and any remaining dissolved gases to evaporate. The usual way of stocking a community aquarium is to include fish and plant species from a wide geographic range that have similar wants and needs. Wants and needs? This means, make sure you community has fish that have the same pH hardness and temperament as the other inhabitants. Don't mix a Cichlid community with a small tetra community, unless you want a fat Cichlid community. It's pretty common sense stuff, but think before you buy. Water pH and hardness can come into play to some extent, but today most of the fish are bred in Florida or Singapore and they produce a fish that can adapt to the "average" fish tank. These tank bred fish are now more comfortable in our average tap water than they would be in their native ranges. The advantage of this is that the fish can now survive in all but the extremes of pH and hardness, which makes them ideal for our community. These can be just about anything you like from just being nice looking to a complete color scheme. You also want to have the fish inhabit different layers or regions of the tank. you want a fish selection that will include bottom, middle and top dwellers. These can consist of lively and sedate fish, nocturnal and diurnal, large and small, just about anything, remembering that they all must fit into the basic definition of "community,"
Now that your plan is in place lets talk about adding the fish. First, how many fish can my tank support? Sounds like an easy question, but it is one that has caused much debate. The general rule of thumb for fish capacity is between one half (1/2) and one inch of full grown fish per gallon of water. The number varies on fish species, filtration and your tank management. You should also take into account the water displacement caused by the gravel and other decorations. Our twenty gallon may only hold sixteen gallons of water! Remember that little one inch fish that will grow to six inches has to be counted as six inches of capacity. Our twenty gallon tank will hold between Eight and Sixteen inches of fish. All tanks must go through a biological cycle before it is safe for them to live in. This is usually done by adding a small amount of hardy fish to the tank and letting the bacteria colonize the aquarium, You can find detailed information in the Genesis section of the site. Before you purchase the fish, observe them in the dealers tanks, make sure they have no diseases and that their fins are wide open and they are swimming actively. You can even ask them to add a little food to watch them eat. Diseases and parasites are very prevalent in dealers tanks so this is very important, for more info visit the disease section of the site. When you finally purchase fish they will be in a plastic bag filled with air, you do not want to add them directly to the tank. Due to temperature and pH differences it is wise to float the bag for about twenty minutes to let the temperatures equalize. Once this is down, you can open the bag and over the course of the next hour slowly add some of your tank water to the bag. This will allow the fish to adjust to any differences in water parameters. OK, now to add the fish, you don't want to just dump them in because you can never be sure of the water from the dealers tanks, its a better idea to gently net them out and release then to the tank. I will provide a partial list of suitable fish for the community aquarium, please bear in mind that there are many more that will do fine in your tank and the best way to find which ones will be OK is to research the fish you want to keep. I also will include the full grown size so you can plan the capacity of your tank. One last note, A lot of fish (especially Tetras)prefer to be kept in schools of at least six so please plan on this when configuring your tank. This is only a small sample of the fish you can have in your Community aquarium. Remember the best way to find out about your fish is to research them. A knowledgeable hobbyist can and will keep his community a happy and thriving showcase. Good Luck! Don't forget to fill out the FORM. to add your set up to the list!